These beautiful, large, partly arboreal sub-tropical lizards often appear in pet shops and are a joy to keep. Sadly the general recommendations for their care do not do them full justice - seldom reflecting their need for adequate water or their size..
Like most arboreal lizards their bodies are somewhat rather taller than wide and they sport a spiny crest which carries on down to the tail. A mature male sports a significantly larger crest than the female The colour is predominantly green with paler stripes occasionally visible although other colours are present particularly on the throat which can be a splendid pink, blue or even both. Both sexes have a gular pouch which is particularly noticeable in the male and is often inflated when displaying. A large male can reach nearly a metre in length (although I have had one who exceeded this) whilst females will seldom exceed 60 cms. I kept these beautiful animals from 1987 until 2005 and bred them nearly every year. I had changed to Physiganthus leseurii with which I hope to have the same success, but a re-arrangement of accommodation meant I was able to start a colony of P. cocinchinus again. They are still young but will hopefully breed next season. Most of these animals are first acquired as youngsters sometimes as little as 15 cms long. The only difference in their accommodation and that of adults is one of size. But, it must be remembered that they grow very rapidly in the right conditions and it is best to be prepared for the adult that is to come. The three key factors to their captive environment are branches to climb, plentiful water and plenty of space. Given this, I would hesitate to recommend anything smaller than a 1 metre x 1.5 metre x 60 cms (W,H,D) vivarium for even a single animal. I have seen some excellent Water Dragon vivaria made from converted wardrobes. A great many books recommend a water bowl for them to bathe in. I have to say that almost any water bowl is bound to be inadequate for an adult Water Dragon. The water container should be sufficiently large for the animal to totally immerse itself in - and to do so comfortably rather than having to try to twist itself into a shape that fits! Given this, I would try to make about half the land area in a vivarium of the size above as water - and to a depth of at least 15 cms - preferably more like 30 cms. Bear in mind that they will defecate in the water so you need to be able to change it easily. Almost never mentioned in most guidance is the provision of some from of flowing water. Even a simple aquarium pump creating a miniature waterfall will be immensely appreciated. Generally, with the benefit of such a setup the first daily activity of a Water Dragon will be, absolutely literally, to have an early morning bath and shower under the waterfall. It should also be noted that these animals come from rain and cloud forest, living on river banks and pool sides and prefer a fairly humid environment which only adequate water can supply. Without these features, daily spraying can help but is no substitute for a good representation of "the real thing". The other half of the vivarium base can be filled with a slightly moist peat/sand mix half left clear for egg laying and half for plant roots. Bearing in mind the vivarium height required the plants should best be climbers. An ideal candidate readily available from Garden Centres is Scindapsus (Devil's Ivy). 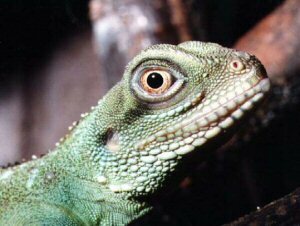 Being forest animals most Water Dragons are distressed if they are over-exposed to UV light - yet like almost all reptiles it is absolutely essential to their well being. Consequently they must have a UV light but they should easily be able to bask in a warm spot away from it. The growth should be encouraged to become fairly thick as this will also help the animals to hide when they feel stressed. Their temperature range should be much more varied than generally recommended both daily and seasonally. They are NOT subjected to constant temperatures in the wild. Chinese animals in particular originate in an area of quite sharp contrasting temperatures. My animals have a summer temperature gradient in the vivarium of 25-35C with a hotspot at 40C. At night times this can vary from 15 - 25C. For a couple of months during the winter the day time temperature is reduced to 15 - 25C with a hotspot at 30C, night time temperatures being allowed to drop to 10-20C (although they have had no problems with occasional nights dropping to about 7C). It is a fact that Water Dragons can be very nervous in captivity and animals are often seen with damaged noses where they have banged them against the glass of the vivaria. I have NEVER had this problem and I attribute this to always ensuring they have enough space, suitable habitat and hiding places. To illustrate further what I mean, my main Water Dragon vivaria is roughly 2 metres square with a height varying from 3 metres to 2 metre with a 1 metre by 1 metre pond measuring 45 cms depth and a 15 cms wide and 30 cms high waterfall. The back half is an almost impenetrable mass of Scindapsus and Passiflora and there are a number of stout vertical and horizontal branches. 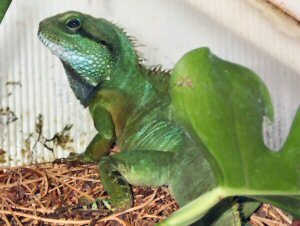 It happily accommodated, at one point, three male and 6 female Water Dragons as well as a number of part grown young. So coupled with the fact that a vivarium such as this can make a superb display, its suitability as habitat also helps keep the animals happy. Yes, they may hide until they get used to you, and, yes, some never may. But if you place your desire to see the animals above their well-being, quite simply you should NOT be keeping animals. Even some experts regard this species as difficult to breed in captivity. Its relative cheapness and availability is due to the number taken from the wild and/or allegedly "captive farmed". In practise I am bound to say that when I kept this species over a period of about 20 years, I had more problems preventing excessive breeding. Given at least a pair kept in suitable conditions it is almost guaranteed. Mating, under the captive conditions described, usually tales place during the Autumn. The males will often display to the females standing sideways on with their gular pouch inflated while nodding their heads vigorously. They will offer a similar display to other males. A subordinate male or a female will generally respond with an arm-waving motion. The male will approach the female and grip her, apparently quite gently with only the tip of his mouth, at the nape of the neck. If she is unwilling and pulls away, she will sometimes lose one or two spines demonstrating that the grip is not as gentle as it appears. If she remains quiescent coupling will occur. After a surprisingly variable period - 1 to 2 months, the female will be ready to lay her eggs. She will find a suitable spot in the sand/peat mix and dig quite a deep hole (15-20cms). I have even had them roll quite substantial cobble stones out of the way to dig their burrow. She will deposit anywhere from 6 to 20 eggs in this. After laying she actually turns round and tamps them down with her nose before refilling the hole and carefully covering it to hide its location - including rolling the stones back. As usual, the eggs are best retrieved and artificially incubated. After about 2 months the eggs will start to sweat, the young will cut a slit with its egg tooth and after a few hours with its nose or head sticking out of the egg will fully emerge. They are very much like miniatures of the adults albeit with disproportionately large heads and must be one of the most attractive of all baby lizards. They will start feeding within 24 hours and growth, particularly initially, is rapid. These are primarily insectivorous lizards and should be fed a suitable range of insects. When fully grown they can handle any of the invertebrates listed in our live foods page. These should be gut loaded and dusted with a suitable multivitamin powder. In addition as large animals they will benefit from the occasional pinkie and some individuals will allegedly eat plant matter - although none of mine ever have! If you are fortunate enough to have them breed then at this stage they require small to medium insects - all but adult crickets are good as are mealworms or other similar sized prey. Gut-loading and vitamin dusting are essential. As already explained, these animals are often seen in pet shops. Allegedly all of those now imported are captive farmed and one would hope that this is the case. Sadly I certainly can't be sure although I will say that MOST modern UK importers do make this statement in good faith. Don't buy an animal unless it is active with clear eyes, no sign of any deformity in legs, tail, body or head and with no apparent scars. Check also that the cloaca is clean - if it not this is usually a sign of internal parasites. More expensive is the Australian Water Dragon (Physignathus leseurii) which has similar requirements but are somewhat hardier and can cope with lower winter temperatures - indeed, they need to hibernate if breeding is to be successful and can even be kept in unheated greenhouses all year round in the extreme south of the UK.